Casey Kastle, one of our most nearest friends in the poker world (and he is even very close including all “non-poker” friends) made the final table in the PPT $500,000 tournament in San Diego and got far as 4th place! Congratulations for that, Casey. Well done! I’m pretty sure many of you know Casey or at least read about him already. 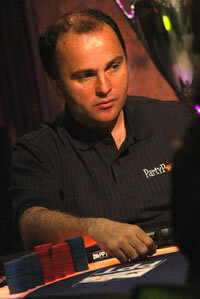 In the latest Bluff magazine top player list he was on 7th spot and his achivements in the WPT events are unmatched. I read he has by far the most money finishes in WPT events (unfortunatly not the most pricemoney :), even far more than Juanda, Hansen or Negrenau. We meet only a few times a year when we travel to the bigger events (he seems to be everywhere) but Katja and I are always eager to see him and talk about the newest stuff. Me regulary exchange emails so we know roughly whats going on in each others life’s and that a good thing. If somebody would ask me who I would I say is the greatest guy in the professional poker world, my answer is clear: Casey is the man! There are two things I especially like very much about that guy: 1) he made out poker life in the US so much better by bringing the WSOP to “non-smoking” (the Mirage and Bellagio followed soon and now most poker rooms are non-smoking) and 2) his business cards reads “Retired“. I have no better word to describe this relaxed, ultra-cool, deep-thinking guy. Casey, you are the nuts! Fortunatly either Katja or I have ever played any serious with Casey, it just never happened. Sure, we played together in Baden at the PokerEM, the worlds biggest stud event, but Casey says (truly) that stud is not his game (the pro’s are coming to Baden for their unmatched cash game madness, this must be the reason why I never ever came back from that event with any money left in my pocket IN NINE YEARS now, lol). We exchanged a few hands in live PLO games but managed to never run into each other. His main game is NLHE. All I know about his game is from reading on the net but based on that there is a clear strategy: avoid him at all cost! Said that, the last two weeks went horrible for us. Since the nice score at the local tournament nothing went in the right direction (up): Katja booked her first three-in-a-row loosing sessions since what feels like forever and I am moving in the wrong direction (down) online to. No scores! I loose everywhere I go: 15/30, 30/60, PL 1000, SNG 200, Multis and even in the million guaranteed I made only place 227th with 220 paid (everybody was in the money about 30 seconds after I busted). This is a not welcome downswing for us 🙁 but hey, I once had a two-year lasting loosing streak so I guess two weeks can be taken still easy. It is almost comical but I have not seen my weighbet opponent for months. Before I saw him more or less every day when I went playing but nowadays we seem to miss each other all the time. I hear he had a bad streak but recovered (so nicely that he is going to Amsterdam now for some high-limit cash game action) but on the weightbet part he is way behind (I hear). Good… but I won’t slowdown, 6 more weeks to go and I am better doing than expected.